For many years now, I have made my own Christmas cards. My love for scrapbooking ensures that I always have plenty of paper and embellishments on hand. To tell you the truth, I don’t think I’ve even purchased any scrapbooking supplies for at least three years! Other than the staples of course (glue, adhesive squares, glitter). Step 1: Cut your solid colored cardstock into a card. I made my card 3 1/2 x 5 inches so I cut it to be approximately 7×5″ and folded it over. Step 2: Cut a piece of your pattered paper to be s tad smaller than the 3 1/2×5 inch to go on the front of the card. Distress the edges of the pattered paper, place on the front of the card using adhesive squares and then distress the whole card with the Distress Ink. Step 3: Place a sticker on the front of the card and cut a small piece of patterned paper to add to the left side of the inside of the card. Attach the paper with adhesive squares. Step 4: I added a rub-on I had that says “Happy Holidays” to the inside of the card. 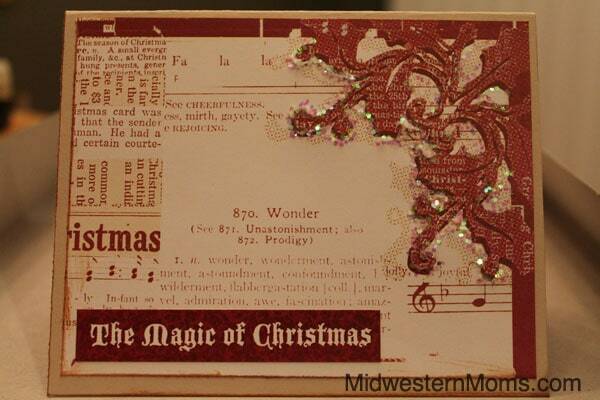 On t he outside of the front of the card, I added some glitter glue and white glitter to accent. Allow glue to dry overnight before you place it in an envelope. Thanks for stopping by to see my craft for today! Be sure to stop by and see Amber and her Handmade Christmas Card today!